What’s the best way to throw a birthday party? Make your way over to The Grid, and we’ll throw the birthday party for you! You’re guaranteed to have one of the best times in your life with some of the newest VR gaming systems available. Any age is welcome and we can host large groups. Who can come to The Grid for Birthday Parties? Usually people associate birthday parties with kids, but The Grid can accommodate any age. You don’t need any previous experience to be able to play virtual reality, but the best way to understand what it’s like is to come experience for yourself. What do you need for a great birthday party? We recommend having a plan to make sure all of your guests are comfortable. To take the guesswork out of it, here’s a simple party plan that’s sure to keep everybody happy. 1 Month before the birthday party: Send out invitations to as many people as possible. This is an easy way to create tighter bonds with close or distant friends and relatives. Even if someone can’t make it, just receiving an invite feels good! 2 Weeks before the birthday party: Call The Grid to make a reservation based on the number of RSVP’s you have received. Come into The Grid to test out the VR and see for yourself how much fun it is! 1 Week before the birthday party: Send a reminder to every RSVP to make sure they’ll all be in attendance. 1 Day before the birthday party: Buy or order all of the food, drink, and party favors you plan to have at the party. Don’t wait until the day of the party because you never know what might happen that will cause a time delay. Day of the birthday party: Relax. You’ve done everything you need to make sure this birthday party is going to be awesome! All you have to do now is show up and enjoy yourself! See how easy that was? Birthday parties are one of our specialties. It comes easy to us because our systems are designed to handle large groups. 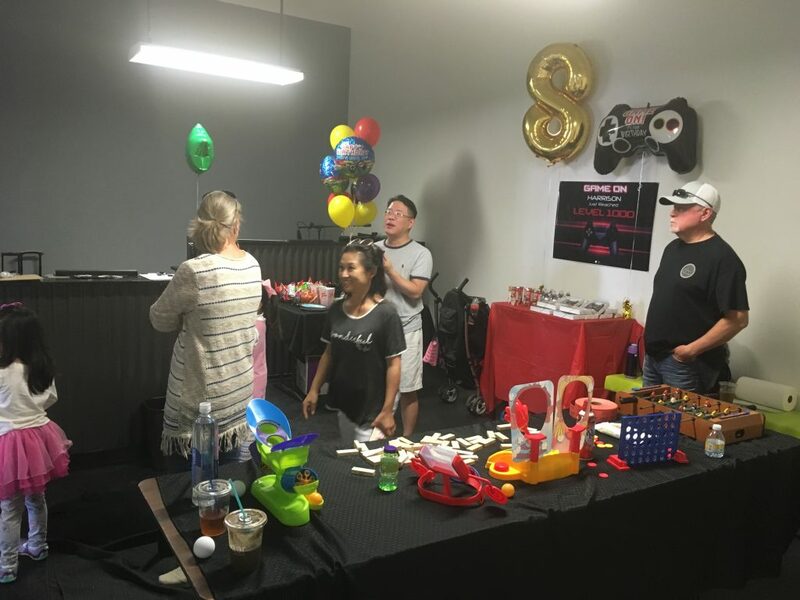 Birthday parties at The Grid are great for any kids and adults. If you’re a parent hosting a large birthday party with children, you can save yourself a lot of stress because the games are so engaging, the kids take care of themselves.